News has been received of the death in action of Private Malachi Kelly, 6th East Kents. The deceased soldier was formerly employed at Messrs. Crossley Whewell's, Reed Makers, Church, resided at 20, Edward Street, baxenden, and leaves a wife and one child. His name is on the Roll of Honour at St. Mary's R.C. Church, Bury Road, Haslingden. 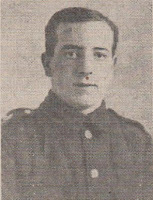 In memory of my dear husband, Malachy, (6th Buffs), killed, 7th September 1918. "Too good and true to be forgotten." His sister in law, Lizzie.